Choose Your Own Father’s Day Post. My very young dad holding a very young me. I have a lot of thoughts swirling in my brain, very few of which can be articulated well right now. So I’m lazy blogging for Father’s Day, and it’s almost like a Choose Your Own Adventure book for you. If you would like to read about taking road trips with my dad, click here. If you would like to read about my dad’s church service, click here. 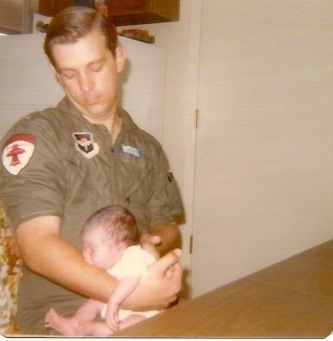 If you would like to read about my dad’s military service, click here or here. If you would like to read about how my dad beat all kinds of odds, click here. If you would like to read a Father’s Day post from three years ago, click here. Happy Father’s Day, to my dad, to my brother, to my brothers-in-law, to all my friends who are dads.